All of the details surrounding the Nintendo Switch Presentation 2017 are starting to come into form. Within the past couple of days, we’ve heard that the event will be broadcast in Japanese with English voiceover while Nintendo president Tatsumi Kimishima will be presenting. One of the final remaining uncertainties is how long it’ll be. Niconico appears to provide an answer. On the live streaming site’s timetable, it shows an estimated length of an hour. That would make sense given how Nintendo’s broadcasts tend not to be overly long. Past E3 presentations usually lasted about an hour, for example. The Nintendo Switch Presentation 2017 won’t be an hour on the dot, but you can likely expect it to be finished in roughly that amount of time, going off of Niconico. 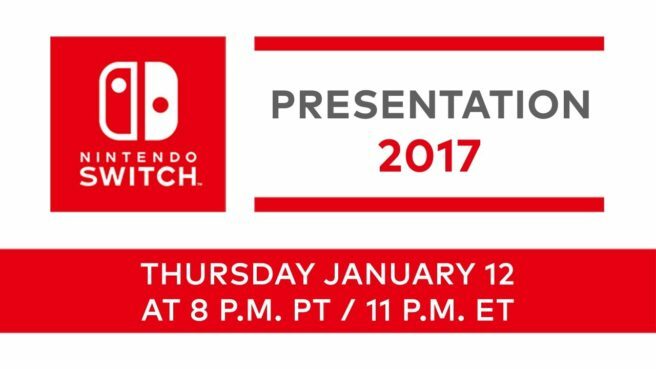 Nintendo’s broadcast kicks off at 8 PM PT / 11 PM ET on January 12 (4 AM in the UK / 5 AM in Europe on January 13). We’ll have a live stream and blog post on the site before it begins.